Inkberry Creative Blog - Graphic Design, Pretty Paper Goods and More! – Tagged "baby's first birthday" – Inkberry Creative, Inc.
Had to quickly share a few more new designs, just added to both shops this past week! 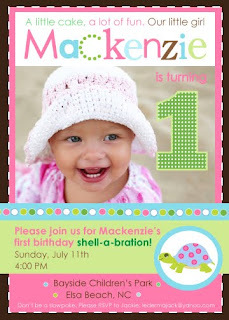 The response to my Trendy Turtle first birthday invitation has been overwhelming! So much so that I have designed the girl version of it for a few new customers this week! Check out this cute pink and green version of the popular Trendy Turtle birthday invitation.